Yes! Physical Therapy Can Make You Smile! Did you know the face has 43 muscles? These are tiny muscles that control facial expressions like smiling, smirking and frowning. In fact, there is a condition called Bell’s palsy that affects facial muscles, as a direct result of nerve damage. The dysfunction affects a primary cranial nerve that controls facial muscles, resulting in temporary paralysis for some, but others experience lingering effects that can last several years. Causes include brain tumor, stroke or Lyme disease. Other causes include viral infections like herpes simplex 1, chickenpox, German measles and mononucleosis. In some patients, no definitive cause can be found contributing to Bell’s palsy. Patients may experience difficulty blinking and closing the eyes, raising their eyebrows, and smiling and frowning. This can also affect taste. Individuals may also experience balance problems, tingling of the face, memory problems and weak muscles. Bell’s palsy can appear as a single condition or as part of a larger neurological dysfunction. Some patients achieve a spontaneous recovery and regain near-normal function. Patients may have lingering problems such as the inability to close one or both eyes, necessitating protection to prevent the eye(s) from drying out. Hearing loss is also common. Men and women are affected, and those with diabetes or upper respiratory ailments face additional risk. Acupuncture/Dry Needling – Used to stimulate specific nerve and muscle sets to maintain facial tone, ease pain, and release stress. Reduces the potential for further neurological damage. 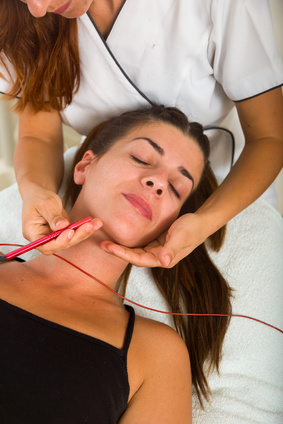 Electrical Stimulation – Stimulation of muscle and nerve groups to maintain tone and improve function. Reduces muscle ‘wasting’ or atrophy. Facial Muscle Exercise – Mild facial exercises maintain facial tone and reduce muscle weakness. Activities are tailored to each individual. Improves coordination and maintains ‘muscle memory’. Clinical Pilates – A loss of balance and coordination can be treated with a specialized exercise program that focuses on small movements to build strength and regain balance. Heat Therapy – Supervised application of hot packs helps circulation around nerves and muscles. Biofeedback – Helps individuals regain movement control by identifying and isolating the pertinent muscles. Helps increase patient awareness of facial muscles. The face is the most recognizable part of the human anatomy. It provides others with insight into our feelings. The muscles of the face allow verbal and non-verbal communication. The loss of control over facial muscles (or any injury to the face) can be extremely intimidating, but we are here to help. A physical therapist is a specialist in movement control for all joints and muscles in the body. We can help you regain function and control. We can also help prevent potential complications. If you suspect you may be suffering from Bell’s palsy or know someone who is, don’t hesitate to call us. We treat a wide variety of diseases, syndromes and conditions to alleviate pain and restore functionality. The sooner you begin, the better. Call us today, and together, we’ll help you face the world.